Risk assets and financial markets around the world have been supported by central bank action for several years. Performing financial alchemy on a scale larger than has been seen in the history of mankind, central banks have hijacked global financial markets. Mountains of liquidity, artificially low interest rates, and the creation of future asset bubbles has been their calling card for the past few years. Unfortunately, time is starting to run out and these great Keynesian minds are on the verge of encountering a series of problems. While central banks can create fiat currency out of thin air, they cannot create real wealth. In fact, central banks cannot print jobs, earnings growth, or an increase in wages. Furthermore, in a paper put out by the New York Federal Reserve in 2012 and covered by zerohedge.com (“Fed Confused Reality Doesn’t Conform to Its Economic Models, Shocked Its Models Predict Explosive Inflation”) the Fed openly admits that forward outcomes cannot be predicted with accuracy by their economic models. Furthermore, one of the models known as the Smets and Wouters Model has predicted significant inflation if interest rates were held near zero for more than 8 quarters. For inquiring minds, I would forward readers to the zerohedge.com article for a more in depth explanation. Ultimately the Federal Reserve is performing a gigantic experiment in real time while admitting their economic models do not accurately portray outcomes in the future. Nowhere can this be seen more than in recent price action in U.S. Treasury prices. Since mid-November of 2012, the 30 Year Treasury Bond has seen prices go down by roughly 9% in value. When Treasury prices are falling, interest rates are rising as there is an inverse relationship between bond prices and yields. When longer term Treasury bonds are demonstrating rising interest rates it is a signal that the bond market is expecting higher inflation levels out into the future. The weekly chart of the 30 Year Treasury Bond is shown below. As can clearly be seen above, prices have been coming down for several months and we have initiated a price pattern with lower highs and lower lows. 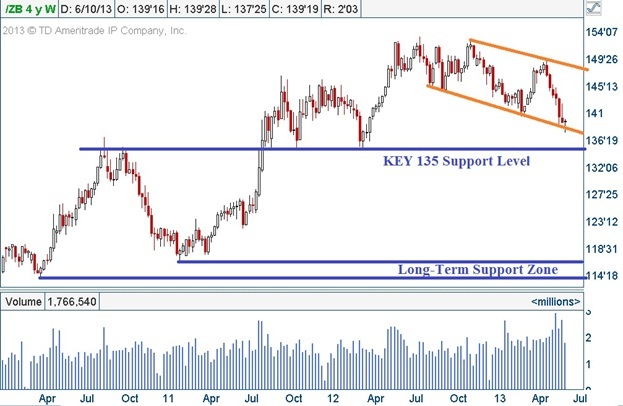 This is not a bullish pattern by any means and should the 30 Year Treasury bond take out key support around the 135 price level the Federal Reserve will be in an awkward position. The Fed’s problem lies in the fact that the Federal Reserve is printing nearly $85 billion dollars of fiat currency to purchase U.S. Treasury and agency bonds and rates have still risen. It would only make sense that at some point, the Federal Reserve will have to ratchet up their program to defend Treasury prices. If the printing presses fire up fast and furiously to help put a floor under Treasury bonds (cap rates), what is going to happen to commodity prices such as oil? As shown below, the oil futures daily chart illustrates a coiled price pattern that ultimately will lead to a strong move in price. 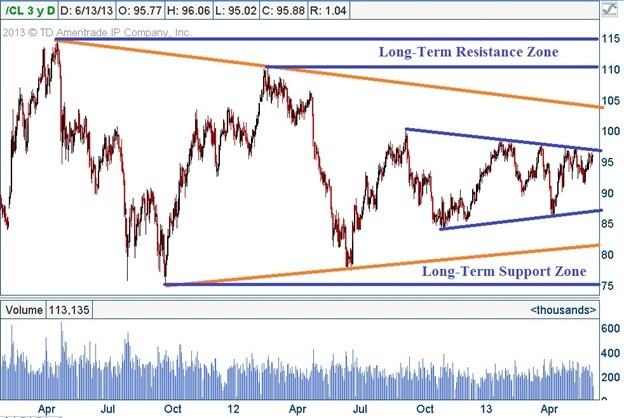 A move in oil prices above the $96 - $98 / barrel level will likely lead to a powerful move higher in oil prices toward the $100 - $112 / barrel range. Obviously a big move is coming and we could see a move lower just as easily. I have no idea where price is going, but what I do know is that oil prices are staged up for a fast, large move in price. 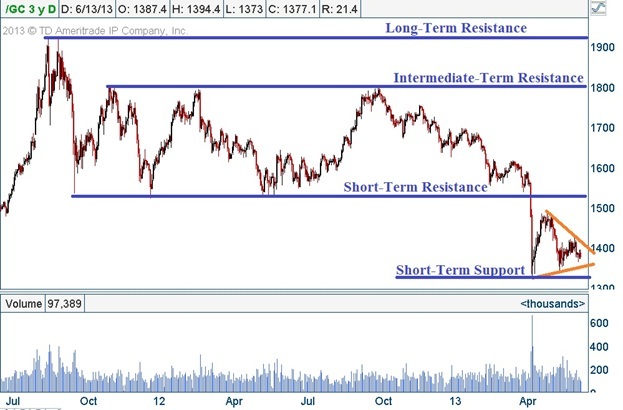 As can be seen above, gold futures are trading in a consolidation pattern which could lead to a strong breakout in either direction. While the upside seems more likely, it goes without saying that lower prices are always a possibility. However, the point I would make to readers is that a large move in the near future seems likely in both gold and oil futures. Gold is simply a hedge for inflation and acts as a senior currency, however if inflation increases gold will protect owners from a reduction in purchasing power. From an economic standpoint, oil and energy prices are far more important than gold prices. If the Federal Reserve’s Smets and Wouters Model is accurate in its expectation of strong inflation pressure in the future, I would anticipate seeing a strong move higher in both oil and gold prices. However, the real point is that the Federal Reserve will likely find itself in a precarious position in the future. On one hand, they have to print money to backstop Treasury bonds through additional quantitative easing machinations. On the other hand, the additional liquidity may start pouring into commodities if inflationary pressures begin to mount. Ultimately the Federal Reserve may attempt to hold down interest rates to help the economy but if their activities cause energy prices to spike the U.S. economy will begin to move toward recession quickly. In addition to that scenario, it should leave many readers unsettled that it would appear Treasury rates are rising while the Federal Reserve continues to print vast sums of fiat currency to buy more government debt. Ultimately, the Federal Reserve does not have a great answer about the future since they publicly admit many of their models do a poor job of predicting future economic conditions based on actions that they are taking. At the end of the day, this is just one gigantic Keynesian experiment worldwide and the outcome will follow historical trends. It does not take an economic genius to understand that the vast amounts of fiat currency created by the unprecedented recent actions of the Federal Reserve will have to find a home somewhere. This process will likely manifest as dramatically higher prices for a host of necessities in the future. In fact, the recent parabolic rise in stock market prices can be viewed not as higher prices for equities, but simply lower valued U.S. dollars. Perhaps instead of concocting models with large names which simply do not work, why doesn’t the Federal Reserve open a few history books. Regardless of what central bankers believe or what their models produce, history’s version of the outcome is simply unpleasant. Ultimately the Federal Reserve should focus on the old adage that those who ignore history are doomed to repeat it.